Busted My Line 6 Spider Iv. Help! Hello guys, I recently did something incredibly stupid. I connected my Spider IV 150Watt amp to my Ethernet cable (not knowing it was for a foot pedal) and all the lights lit up and it made a loud sound. 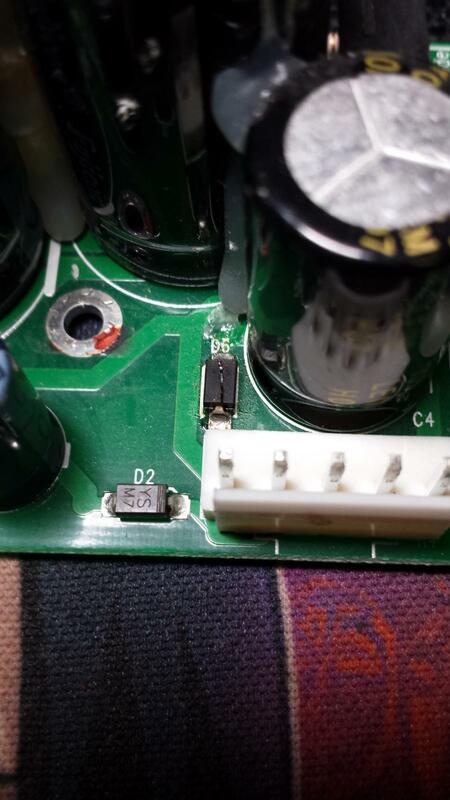 A friend opened it up and we found a blown capacitor. I havent been able to identify a replacement online. its on the D6 port and its small an has YS M7 on it. can anyone help me locate one? I suspect it might be behind the loss of power cuz it stopped turning on after a while, but I suspect there might be other things that need fixing. Can anyone help me out?? why not just buy the whole PCB? its only around 20 dollars. is that not just a fusible link dude inside the amp that blows when a problem occurs? Wow that's not bad. Thanks for the link man. I'll replace it and hopefully that's the only issue. Is there a security chip in the S4s? I did the same exact thing to mine and I replaced the PCB just like yours and now the leds dont light up and the text box just has a black bar going through it. That's an indicator that there is something else in the amp not working, a service center can diagnose it.